28 May 2014 : Qatar Airways flights from Edinburgh to Doha are launched, creating 1-stop options from Edinburgh to Cape Town, via Doha. There are no direct flights from Edinburgh to Cape Town (South Africa). 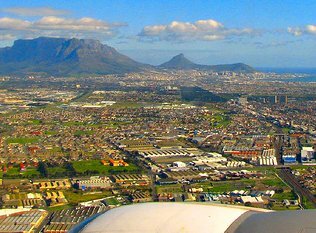 There are more options for flights from London to Cape Town. If you can make your way from Edinburgh to London, you may wish to look at the list of airlines flying from London to Cape Town. Flights from Edinburgh to Johannesburg and flights from London to Johannesburg are more competitive than the equivalent flights to Cape Town, so sometimes it's cheaper to fly to Cape Town via Johannesburg. Check what it costs to fly from Edinburgh to Johannesburg, and then travel from Johannesburg to Cape Town on one of the South African low cost carriers (or a higher cost carrier if you have a fat wallet!). Here the strategy is to first fly from Edinburgh to London, then travel from London to Johannesburg, and thereafter travel from Johannesburg to Cape Town.